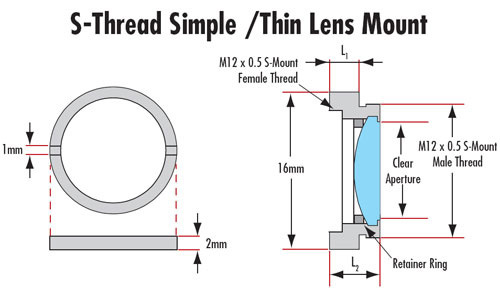 TECHSPEC® S-Mount Optic Mounts are designed to mount a variety of optical components into S-mount compatible systems. A threaded retainer ring that has been designed to accept a standard straight flat blade spanner wrench holds the optical component securely in place. 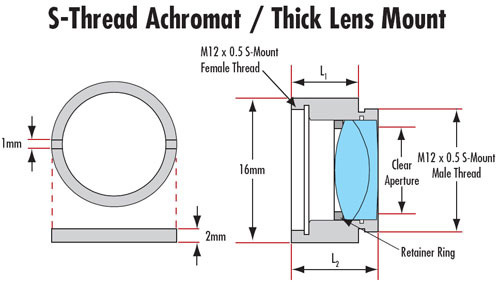 TECHSPEC S-Mount Optic Mounts are threaded for M12 x 0.5 mounting, with a 16mm outer diameter.